Good to see your back at it, Phillip! Projects like yours really make me wish we had been able to have kids that I could share my hobby with. Thanks for the support. It felt good to get out there and turn wrenches again. Especially since my son is interested. He's kinda' laid back like his Dad, and doesn't get excited about too much, but he seems really excited about getting the Malibu "fixed-up". Yep, black selt belts. Another reason I may decide to go with black interior. Also, if I dye the dash and some other parts, it should be pretty easy since it is a dark burgundy color to begin with. The grill/header is off a 82-up Malibu/El Camino. It was like that when my dad bought it. I can tell there was some front end damage at one time on the car, so I guess that's when they put the different header on it. Monte SS wheels. My Dad put them on there. Not sure what model, mid to late 80's? I originally planned on a lift, that's why I built the garage with the high ceiling. It is something I still plan on doing. It would definitely be nice to have. 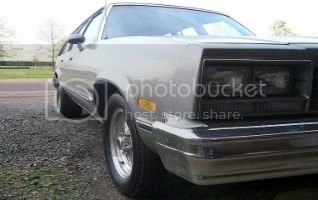 I'd really like to go all out with it (that's just the nature), but I probably will stay conservative on the restoration. I'd love to do brake upgrades, nice suspension pieces, etc. Since this will be his daily driver, and the likelihood of him wrecking it in the first couple years, I'll just pretty much do the things I've outlined. I may put some aftermarket rear control arms on it. Those wheels are 86-88 RPO N90 Monte SS wheels, unless they use a "unilug" style lug nut with an integral washer. Then they're 80-81 RPO N90 Z28 wheels. You must be bringing him up right (no rice). Here is my proud papa moment. Was crewing for my friend,runs a old school 7 second FED. 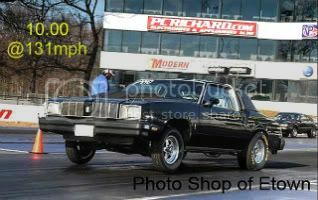 His daughter runs similar looking Jr Dragster. My 8 year old daughter tagged along. We were running our ###'s off between the 2 cars, both being remote started etc. etc..
Anyway,we got caught up with an issue with his dragster and kinda forgot about his daughter in the staging lanes. We hear them starting to run, Oh sh%T, look up to see my daughter pushing his daughter's Jr. threw the lanes like she had being doing it for years. Almost brought a tear to our eyes! Can't wait until they (I got 3 girls ) are a little older. It's always cool to see a new hot rodder surface with a non-rice car. He'll have something very unique compared to all his friends. He'll always remember building his first car with his Dad. I'm completely jealous. My 17 year old is still not interested! Bench seat, column shift, and power adder hub caps. Best ET on motor, 11.27. Best ET with caps, 9.82.
great to see phillip... I cant wait to see the rest. Very cool to see the younger guys into american cars and not just f-bodies, vettes and mustangs! and welcome to the jackstand Club!!! Very cool Phillip, you are one of the guys that prodded my interest in the quest for speed and quickness. Your youngster is a lucky young man, to have such a mentor. My boys are 7 and 10 and the talk has already begun about what we are going to do. It will be fun watching the updates of another build from you. Good to see you and your son enjoying a project together. Thanks again for your work on this site. Good luck with the project. Some of my best memories are my dad and I wrenching. Been waiting to see how this turns out! 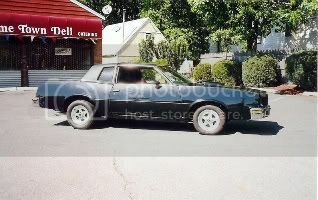 I have a 15 year old too, he wants a Camaro like the 67-69 only. Only problem is he doesn't have the patience needed to start spinning wrenches.